The Hotel provides tow exclusive restaurants with Different layout.our menu contains modern Nepali, Continental, Indian, Italian, Chinese, Mexican cuisine with a reasonable price. We can also support you with catering services, and transportation to the attendees if requested. Hotel River Park offer a full serviced Travel/ Information desk to address your travel needs. From City information to Sightseeing, Local/ International Ticketing to Himalayan Trekking, Hiking to hanging on Paragliding, Mountain Biking to Pony Riding, Car hiring to Guide hiring or any of your requirement will arrange by our Travel expert. It's easy & hassle Free !!! Appointed on 7th floor & lifted by Elevator, our Conference Hall is an ideal venue to host your gala events. 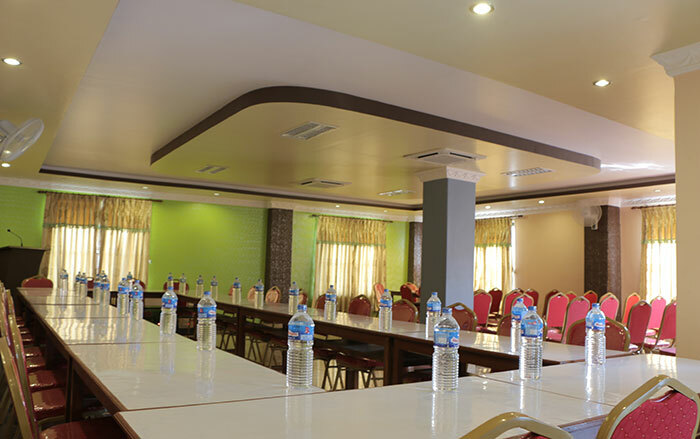 Spacious Conference facility having a capicity of upto 100 people with spectacular views of Himalaya and Lake is simply awesome venue for any type of events or gathering in Pokhara. Regardless of events, a veriety of Setting options are available with access of high speed Internet, state of the art Audio visual system, Aircon, hygnic Catering & professional service. Host your meeting with us, success of your event and your complete satisfaction is our price concern. We have designed to help you plan a successful & memorable events.